Should I Buy Uber Stock When It Debuts? Subject: Should I Buy Uber Stock When It Debuts? 3 × 4 = Required Please enter the correct value. 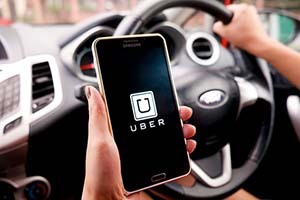 Investors who have heard that an Uber initial public offering (IPO) is in Wall Street's future may be wondering when they can buy Uber stock. An Uber IPO is likely to be one of the hottest and biggest IPOs since 2014's Alibaba Group Holding Ltd. (NYSE: BABA) IPO. Projections place the Uber valuation before the IPO at $100 billion. Uber has gotten such a massive valuation because it's an industry disruptor. Uber was founded in 2011 and is an app that connects people wanting a ride with people offering a ride. It's very different from traditional taxi and limousine companies. Uber's business is an app and it works with contractors that drive for the company. It does not own a fleet of vehicles like taxi and limousine services. Uber contractors must have their own cars. Users of the Uber app enter where they are currently located and where they'd like to go. The contractors can choose whether or not to respond. The drivers pay a 20% commission to Uber and are also responsible for the cost of maintaining the vehicle, gas, insurance, and any tolls. Uber has enjoyed great revenue growth and rapid market share penetration. During all of 2014, Uber achieved more than $495 million in revenue. The revenue figure for its second-quarter 2016 came in at $1.1 billion. That's 122% above the entire 12 months of 2014. In 2014, Uber booked $2.93 billion worth of business. During the second quarter of 2016, bookings were 70% more, at $5 billion. Business use is one of the biggest drivers of market share for Uber. It was only 9% in the first three months of 2014. Most businesspeople – 52% – used taxis, while more than one-third rented cars. But one year later, businesspeople called Uber 29% of the time. Most of the business gains were taken from taxis, which only 35% of business users hailed in 2015. Rental car use was a few percentage points lower in 2015 thanks to Uber. Despite the increased use of Uber, the company is not yet profitable. In fact, according to Bloomberg, Uber has lost $4 billion since its inception. In the first six months of 2016, Bloomberg indicates that the company lost $1.27 billion, but the revenue growth and market share increase imply that profitability will come. Given the current money-losing status of Uber, it may initially need to do an IPO to raise cash.